This circular saw safety and ergonomics section is only one part of our circular saw article series. The table of content of the entire circular saw review can be found here. Safety on an ordinary pendulum guard circular saws, be it sidewinder or worm drive style, largely depends at the circular saw blade guard. The guard covers the circular saw blade in the parking position. It's also where the saw is set when it's laid on the ground or other resting surface. 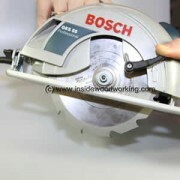 An excellent example of circular saw safety, combined with user-friendliness is this Bosch cordless circular saw. The robust blade guard can be opened with the use of an extra large lever that makes it easy to handle, even when wearing gloves. Makita circular saw provides additional safety. This power tool offers a rigid cast metal blade guard that lifts automatically as you begin the cut providing extra safety and using a large push-wheel. On any circular saw, including stationary table saws, the riving knife is a key safety component. What is a riving knife? What is a riving knife for? A riving knife is piece of metal shaped something like a wedge that is located directly behind the cutting blade. 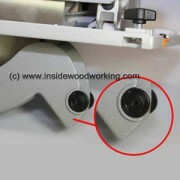 On smaller table saws, it will usually hold the blade guard. Riving knives on these portable saws are slightly thinner than blade-widths (about 20-30% less) and recess about 1/4" (24 mm) below the blades diameter. When a saw cuts through wood, the wood has a tendency to "squeeze" around the rear of the blade. To prevent any squeezing, a riving knife is used. It keeps the saw kerf open, especially when cutting hardwood. For example, in very deep rip cuts of oak wood, squeezing will cause the blade to literally burn the wood. A proper riving knife prevents this. In addition, a proper adjusted riving knife prevents the saw from kickback. Kickback occurs when the cut material reaches the opposite side of the blade, and the blade rotating, tends to push the material away from the saw. This kickback motion is minimal when a riving knife has been adjusted close to the blade. The action of a riving knife closes the gap between the teeth of the blade and the material being cut. The riving knife on the portable Dewalt circular saw. The riving knife is fixed safely to the housing of most saws with screws. This allows you to remove it for plunge cuts. Depending on your country's regulations, some power tool companies make circular saws without a riving knife. You may encounter this on some mini or small circular saw models (trim saws). 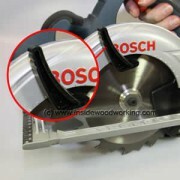 You should be aware as you use these saws that they lack a necessary safety feature. Excellent safety and high usability. The German manufacturer Mafell offers various circular saw models with a riving knife that "flips." 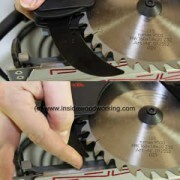 The Flipkeil riving knife works as it is pushed up into the saw as you make the plunge cut. This benefit works for any type of insertion-cut. It flips back out as you continue to safely cut through a few inches. 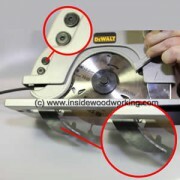 An often-underestimated safety feature on these popular saw is a blade brake. Most professional circular saws, mid-size and up, are equipped with an electronic blade braking system. This benefit will halt this saw safely in seconds especially if you're working on a job where you must accomplish a large number of quick cuts. As the saw switches on and off repeatedly you'll appreciate any incorporated blade brake system. Needless to say that a blade brake system that stops the circular saw quickly within seconds, can be an indispensable safety feature if your working in a hazardous or dangerous situation. Blade guard, the riving knife, and blade brake, all are some key safety features that any professional circular saw must have. Apart from these direct safety components, there are various other components influencing safety on circular saws. Let's look at how the tool's power, weight and ergonomics influence your safety while using a saw. electronics, variable speed, ergonomics and weight.